B&B owners reveal their secrets for cooking up inexpensive and memorable recipes for the holiday in the newly released expanded 2nd Edition of "Discover Iowa: Cooking with Iowa Wines, Meats and other Iowa Products" by Amelia Painter. Dec. 16, 2008 - PRLog -- The holidays are here and it's time for entertaining friends and family. While extravagant dinner parties seem impractical in unyielding economic times, pinching pennies doesn't have to conflict with your holiday events. Entertaining can be simple, especially this time of year when everyone has a company party to go to and planning to also get together with family. No one knows this better than Lee Olson, innkeeper at The Decker House Bed & Breakfast in Mason City, Iowa. "Brunch or lunch can be just as fun and either can be created inexpensively. You can start as early as 10 a.m. or as late as 1 p.m. All you need are a some tablecloths, decorations, casseroles, desserts, and, of course, some coffee and other holiday beverages. Hosting guests for breakfasts and brunches for a living, Iowa B&B owners reveal their secrets for cooking up inexpensive and memorable recipes in the newly released expanded 2nd Edition of "Discover Iowa: Cooking with Iowa Wines, Meats and other Iowa Products" by Amelia Painter -- a publication of the Iowa Bed & Breakfast Innkeepers Association. The plethora of gourmet products lining the grocery store shelves may seem appealing, but the sizzle has a cost. Ric Roxlau, innkeeper at The Manor Bed & Breakfast in Fort Madison, Iowa, creates his own speciality chocolate coffee blend. His guests are always asking him the brand name of the wonderful brew. He openly shares his high quality, but reasonably priced method of creating "The Manor Coffee Blend." When it comes to protein, eggs remain the best "bang for the buck" in food purchasing decisions. Like most Iowa B&B owners, Carolyn Price, innkeeper at the Elderberry Inn located in Forest City, Iowa, always uses the freshing ingredients that can be found. And, consider using real vanilla, butter, and high quality sour cream if using it as a garnish. However, if you are going to use the ingredients in baking, you can often store-brand ingredients and save. While most of us are cooking over the holidays, not all of us are gourmet chefs, but lack of kitchen expertise doesn't mean resorting to take out or the local catering company. Painter recommends choosing brunch and lunch recipes easily altered by variations of ingredients. And, a number of the recipes in the new Discover Iowa cookbook can help holiday menus out because they can be prepared the day or night before. From traditional Simple Rhubarb Bread to the 2007 National Beef Cook-off's Winning Smoky Cilantrol Pesto Beef Crostini to chicken dishes made with wine, and more, we're sure you'll enjoy this recipe collection. The cookbook also includes tips and strategies for planning your meals. This cook book is also a reliable guide to the inns themselves, including addresses, phone numbers, and websites. Bed and Breakfast enthusiasts will find the book easy to take with you on in-state excursions. The book is organized by Iowa towns and, of course, the index helps readers find the recipes quickly. The organization’s goal is to connect the traveling public with their 80 plus member inns and enable travelers to have a dynamic, unique, and cultural travel experience. Innkeepers can be a great resource on the area you are visiting, and are available to assist you with whatever your particular needs might be, be it sightseeing tours or special community events. This cookbook is one of a kind! And just in time for holiday giving or holiday meal planning. 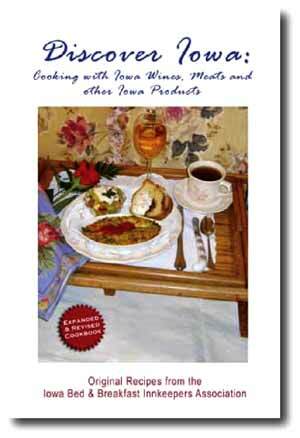 "Discover Iowa: Cooking with Iowa Wines, Meats and other Iowa Products" can be purchased at Amazon.com and other online book stores. For an autographed copy from the author, call 712-580-4242 and place a phone order requesting the book be signed by author.